Travis County prosecutors say “criminal intent would be difficult to prove," so they're not pressing charges against Agriculture Commissioner Sid Miller for controversial state-paid trips to a Mississippi rodeo and to receive a "Jesus Shot" in Oklahoma. Editor's note: This story has been updated with a statement from Texas Agriculture Commissioner Sid Miller. A statement posted Tuesday to Miller's Facebook account said the commissioner was "pleased this process is now complete and that he has been cleared of any wrongdoing." The statement also thanked the Travis County District Attorney's office and the Texas Rangers for their "professionalism." In previous interviews with The Texas Tribune, Miller called Progress Texas’ complaints “harassment,” and said “there’s nothing absolutely illegal or wrong with either of those trips." In March, the Houston Chronicle first reported Miller's trip to Oklahoma to obtain a so-called "Jesus Shot," which some believe cures all pain for life. Miller said he made the trip so he could tour the Oklahoma National Stockyards and meet with Oklahoma officials. But those officials told the Chronicle they had no plans to meet with Miller that day. Internal emails from the Agriculture Department later indicated that Miller had planned the trip around receiving the shot. After details about the trip became public, Miller vowed to repay the state for the trip out of an "abundance of caution." Miller also traveled to Mississippi in February on the state's dime. There, the world champion calf roper participated in the National Dixie Rodeo. When asked about that trip, the Agriculture Department gave contradictory reports to media outlets. The Houston Chronicle reported that Miller took the state-paid trip to Mississippi to participate in the National Dixie Rodeo but later repaid the state with campaign and personal funds. He told the Chronicle that the intent of the trip was to meet with agriculture officials there, making it a legitimate state-covered business trip. Miller said after those meetings fell through, he repaid the state for the trip with campaign funds because he also met with donors and advisers during that time. “Additionally, the total amount spent on the trips was relatively small, the state has been refunded all the money it expended on these trips, and the facts have been made known publicly so that Commissioner Miller is likely to be more careful in the future," the memo said. Texas Agriculture Commissioner Sid Miller said he is working with GOP presidential nominee Donald Trump’s campaign to help lead an agriculture team. 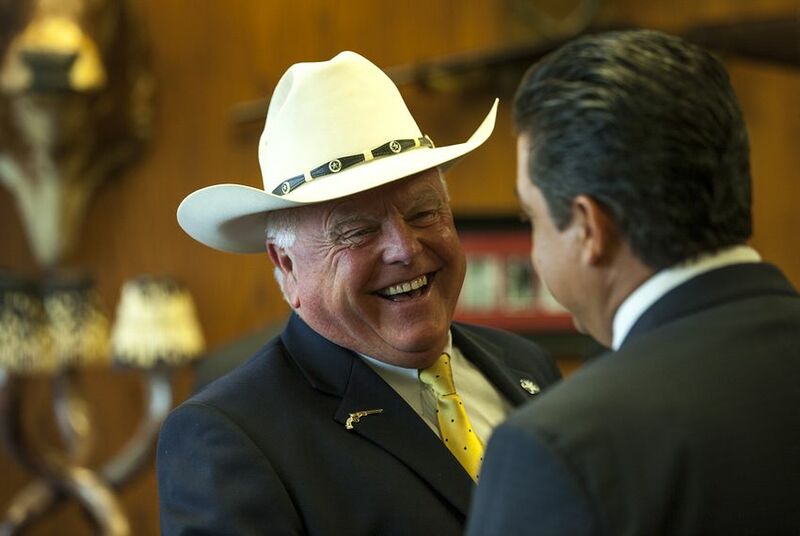 Four complaints were filed against Texas Agriculture Commissioner Sid Miller in 2014 involving his campaign finance reports as a state legislator. One investigation has been closed, and Miller says he expects the other three to be dismissed. As Texas agriculture events go, the Houston Livestock Show and Rodeo was a must-do for state Agriculture Commissioner Sid Miller and his staff. But Miller had more than an industry interest. He also had a personal one.